The Chicago company of Wicked will play its final performance on Sunday, January 25, 2009, at the Ford Center for the Performing Arts, Oriental Theatre. Upon closing, the record-breaking production will have played exactly 1,500 performances and grossed over $200 million at the box office. Wicked /Chicago started performances on Friday, June 24, 2005. During the course of its open-ended run it has become the top-grossing and longest-running Broadway musical in Chicago history. For the week ending December 30, 2007, Wicked grossed $1,418,363 and broke its own record for the second time as the top earner during a single week in Chicago. By January, the Chicago company will have performed to an audience of well over 3 million people, representing all 50 states, 2 U.S. territories and over 20 foreign countries. 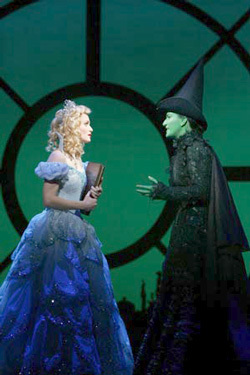 The first national tour played seven sold-out weeks in Chicago before making way for the sit-down production of Wicked. Producer David Stone states, "Of all the companies performing around the world, we have been most proud of the success and accomplishments of Wicked in Chicago, because it had been decades since a dedicated Broadway company was created for this wonderful city. From the moment we decided to make Chicago our home, the entire city has truly embraced and welcomed us. We thank Mayor Richard M. Daley and Broadway In Chicago for their tremendous support and leadership. Chicago is renowned as a world-class city for theatre, and we have been honored to be a part of the city's vibrant and growing Downtown Theatre District. Chicago will always have a very special place in Wicked's heart." Mayor Richard M. Daley states, "I congratulate the Chicago company of Wicked on their phenomenal run in the Downtown Theatre District and thank producers David Stone and Marc Platt, as well as Broadway In Chicago, for having the foresight to launch a resident company of Wicked in Chicago. The effects and economic impact of the show’s long run in Chicago will continue to be seen for many years to come. The future of our city as a national center for theatre and a cultural landmark worldwide is very bright." James M. Nederlander, Chairman of the Nederlander Organization, stated, "I've always believed that Chicago was a long-run town, but Wicked has far surpassed any expectations we may have had. It is by far the most successful musical that we have hosted, not only in Chicago but also in the entire 100-year history of the Nederlander Organization across the country. It has been playing to sold-out houses since it opened four and a half years ago at our Gershwin Theatre in New York, as well as for the past year and a half at our Pantages Theatre in Los Angeles." Declared "A Cultural Phenomenon" by Variety, Wicked currently has productions in New York, Chicago, Los Angeles, London, Tokyo, Stuttgart, Melbourne and on a North American tour. Tickets for Wicked can be purchased at ticketmaster.com.